Priests and seminarians: “Why are you waiting to fight back?" "The Pope had hoped for a change ... but the diocesan curia, made up of ex-‘68ers, has allowed for nothing." Practically everything is allowed, everything except Tradition that is. 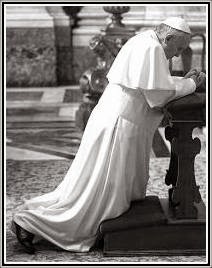 After the courageous but at the same timid act by Benedict XVI when he constituted the Motu Proprio in 2007, we have witnessed a continuous effort to “confine” Tradition from the Church. The Holy Father said that the Old Mass had never been abolished. In some way, he confirmed that it could not be abolished, because Church Authority serves to guard Tradition as source of Revelation, just as it serves to guard Holy Scripture, and may never lord over them; if it lorded over them, the Authority [of the Church] would not be that willed by Our Lord and would take the form of authoritarianism. 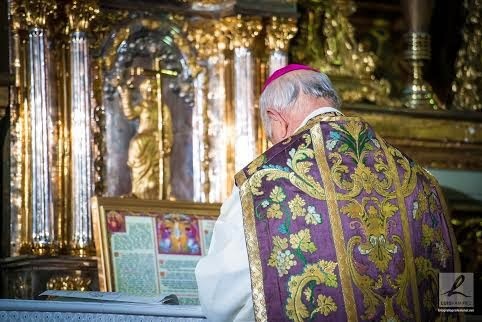 Well then, after the Motu Proprio, Summorum Pontificum, the various diocesan curia engaged themselves in an unwavering work of stopping, stemming and confining any attempt at a return of the glorious Tradition of the Church, whether it was liturgical or doctrinal. The last day of the calendar year is when we give thanks for the past 365 days. Even though Anno Domini MMXIII was a roller coaster of a year in the Church, we still have plenty to be thankful for in our lives. The traditional sacraments, good priests and religious, family, friends and health are hopefully some of things for which we can give thanks today. For loved ones lost this year, perhaps we can give thanks that they were given Last Rites and, God-willing, died in the state of grace. To that end, the Church grants a plenary indulgence today (31 December) under the usual conditions for publicly saying or singing the Te Deum "for the favors received in the course of the entire year." The Sunday before Christmas I was in Manhattan for an afternoon concert at Carnegie Hall. 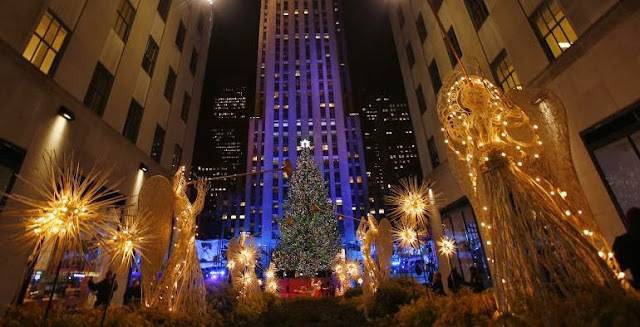 After the concert we decided to stop at Rockefeller Center to see the Christmas tree and look at the skaters gliding on that rink that is a most unlikely surface amidst the Art Deco splendor of that peculiar place in New York. The crowds were dense. It was hard to walk at all. That particular evening was abnormally warm for December. The air was oppressively humid. We finally got to the opening where one walks into the plaza itself. There were those angels with their trumpets, angels made out of some abstract plastic stuff, not ugly but not angelic, if you know what I mean. And in the center of the plaza there stood the giant tree, this year from Shelton, Connecticut. Below, please find the seventy-eighth posting of enrolled Souls of the Rorate Caeli Purgatorial Society. Priests: The Souls still need more of you saying Mass for them! Please email me to offer your services. 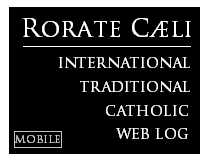 There's nothing special involved -- all you need to do is offer a weekly or monthly TLM with the intention: "For the Souls enrolled in the Rorate Caeli Purgatorial Society." How to enroll souls: please email me at athanasiuscatholic@yahoo.com and submit as follows: "Name, State, Country." If you want to enroll entire families, simply write in the email: "The Jones family, Ohio, USA". Individual names are preferred. Be greedy -- send in as many as you wish and forward this posting to friends as well. And please follow this formatting strictly. Please consider forwarding this Society to your family and friends, announcing from the pulpit during Holy Mass or listing in your church bulletin. We need to spread the word and relieve more suffering souls. Last Wednesday, the Rorate Solemn High Mass in the Dominican Rite was celebrated at Star of the Sea Church for the very first time. The celebrant was Fr. Anselm Ramelow, O.P., assisted once again by the friars from the Dominican School of Philosophy and Theology (Berkeley, CA) and St. Dominic’s Church (Benicia, CA). Star of the Sea was the 2nd church in the entire state of California (the other one was St. Stephen the Martyr in Sacramento) to have offered this kind of Mass! Many thanks to the Dominican Friars for their assistance in making this possible. Photos and full-length video of the Rorate Mass can be viewed here. Archbishop Salvatore Cordileone will introduce the new Benedict XVI Institute for Sacred Music and Divine Worship. Fr. Samuel F. Weber, OSB will give a talk on the spirituality of chant. Afterwards, we will celebrate vespers with the Archbishop. Refreshments will be provided. For the latest updates, visit here. Eventually the Jesuit-run Centro Astalli, dedicated to aiding refugees, in combination with the local branch of Caritas and civic officials, stepped in to organize a funeral service. Among other dignitaries expected to be on hand is Cécile Kyenge, a Congo-born politician and ophthalmologist who serves as Italy’s Minister for Integration, making her the first person of color to serve in an Italian cabinet. In a Tweet about the funeral, the Vatican writer for Corriere della Sera, Gian Guido Vecchi, referred to it taking place in “the church of Francis,” presumably a reference to the fact that it’s happening at the mother church of his Jesuit order. Certainly we have no objections to burying the dead, which is one of the corporal works of mercy -- but it is one thing to have buried Mr. Quintero respectfully but quietly, and another to give him a prominent Church funeral in the full glare of publicity, in the presence of civil dignitaries and in the main church of the Order to which the reigning Pope belongs, with the intention of doing so to make a point against "discrimination." And it is still another thing yet that, as ANSA reports, during the funeral, the main celebrant (Msgr. Enrico Feroci, the Director of Caritas for the Diocese of Rome) referred to Mr. Quintero as "she" throughout the religious service. 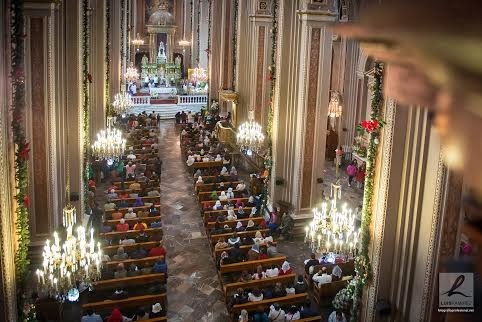 Archbishop Alberto Suarez Inda of Morelia celebrated a Solemn High Traditional mass on Christmas Eve at his cathedral in the city of Morelia (state of Michoacán, Mexico). This marks the first Traditional Mass a Mexican residential bishop celebrates in his cathedral since the motu propio Summorum Pontificum was promulgated in 2007. 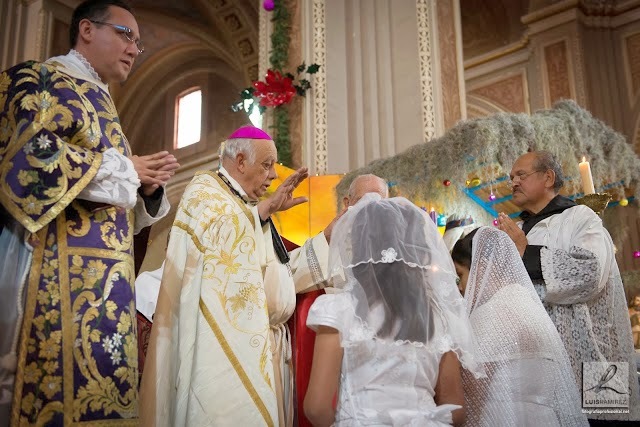 Before the mass, Archbishop Suarez Inda also conferred the sacrament of Confirmation to two young women of the Latin Mass community of Morelia. The TLM apostolate started in september of 2011 with a Sunday mass at the "Señor de la Columna" chapel and is currently served by diocesan priests with the help of the archbishop under the provisions of the motu propio. 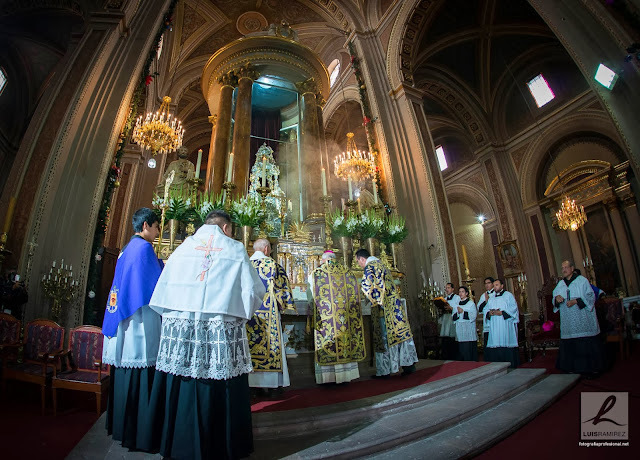 Also important to mention is that when the TLM apostolate in Morelia started, Archbishop Suarez Inda made sure to express his support for it by celebrating the first mass and that this constituted the first TLM celebrated by a Mexican bishop since in at least the last 40 years. On behalf of Una Voce Mexico we wish to express our public gratitude to Archbishop Suarez Inda, the group of chaplains of the TLM community and the canons of the Morelia Cathedral of the Transfiguration of the Lord for making possible the return of the Traditional Latin Mass to one of the most important and beautiful cathedrals in our country and hope this will be the first of many more celebrations in the future. On Dec. 14th, His Excellency Bp. Roger Foys of the Covington, KY Diocese (across the river from Cincinnati, Ohio), offered the traditional rite of confirmation at the Covington Cathedral. It was a beautiful ceremony with fine music and eight confirmandi. We at Una Voce want to offer public thanks to this good Bishop for offering the traditional confirmation, which is the first one in the local area since the 1960s.